← Traveling During The Holidays? Stay Sane With These 5 Tips. The weather outside has been quite frightful across much of the United States recently. Many areas of the country — including North Texas — have been dealing with frigid temperatures and ice, which has left millions of people with a whole host of new weather-related questions. 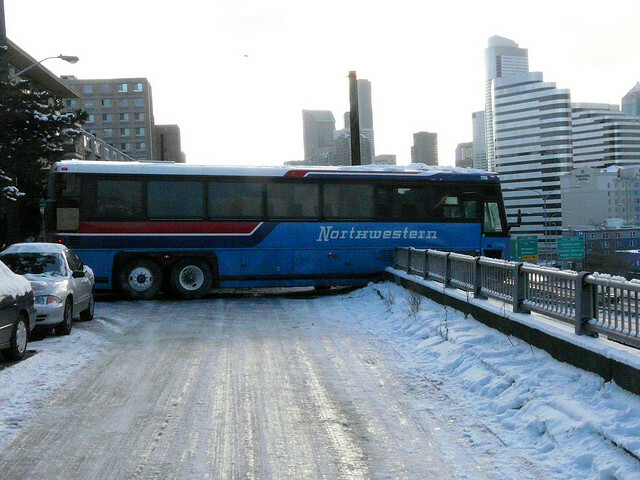 In particular, many people have questions about how ice can snarl up roadways so easily. Here’s a closer look at some common ice storm-related questions. Will it snow, or will it rain? It all depends on the temperature and the atmospheric conditions. What’s the difference between sleet, freezing rain and snow? Freezing rain is rain that freezes as soon as it touches the ground. This often occurs when the ground temperature is below freezing but the air temperature is slightly above the freezing mark. Freezing rain commonly leads to a thin layer of dangerous ice on the ground and roadways. This ice — known as black ice — is very slick, but it’s often hard to spot until you slip on it or your vehicle skids on it. Sleet is falling ice pellets. It occurs when snowflakes warm into rain droplets and then freezes again while still in the air. Generally, this situation happens when the ground temperature is below freezing, but the air temperature varies at different levels of the atmosphere. At cloud level and close to the ground, the temperature is below freezing, but there’s a mid-level pocket of air that’s above freezing. Sleet pellets will often freeze into a thick, white sheet of ice when it’s on the ground. 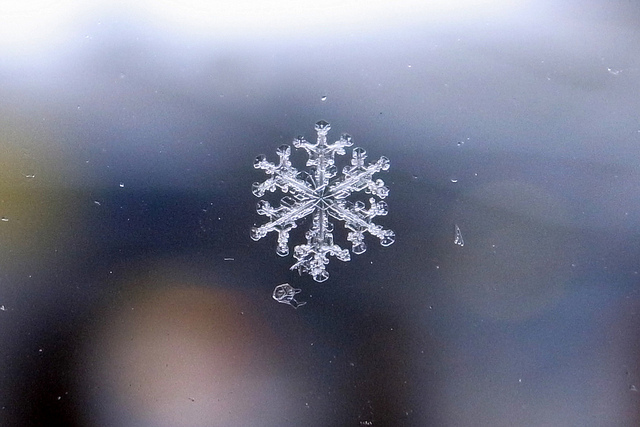 Snow is actually frozen water crystals that remains frozen as it falls to the ground. Snow falls and sticks when the ground temperature and air temperature is below freezing at all levels of the atmosphere. Snow can accumulate quickly and thickly, but it’s less dense than ice. This also makes it less slick than ice (although heavy snow can still cause life-threatening situations). Snow is the predominant form of winter precipitation, since conditions are often below freezing before a storm arrives. In warmer climates — such as the southern United States — a cold rain will often fall, since temperatures are still above freezing. However, when a storm hits just as the temperature falls below freezing, sleet and freezing rain can cause an icy mess. Since the surfaces of bridges are separated from the earth’s surface, they can drop below freezing much faster than other parts of a road can. Why do bridges and overpasses tend to be icier than other parts of the roadway? Ice can accumulate on surfaces that are below freezing when moisture hits them. However, elevated surfaces can freeze a lot quicker than the solid ground can. Why does solid ground take so long to freeze? The earth retains a lot of heat from the sun’s rays, which is radiated upwards to its surface. This retained heat helps keep the ground temperature warm, even when the air above it is below freezing. In fact, it can often take hours of exposure to sub-freezing conditions for the ground to finally dip below that freezing mark. 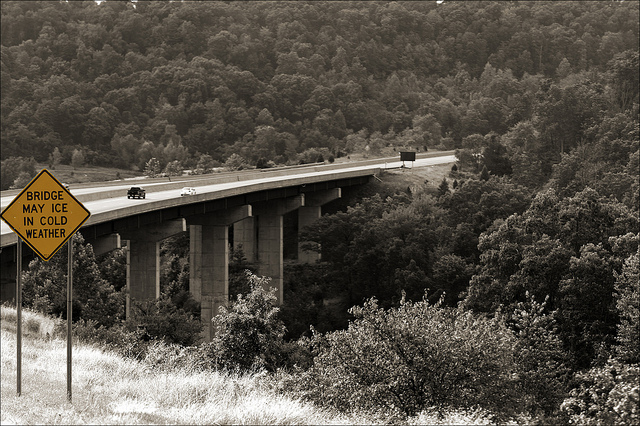 However, bridges, overpasses, roofs, wires and other elevated surfaces aren’t directly connected to the earth’s surface. This means that they’re cut off from that reservoir of retained heat in the topsoil. As a result, these surfaces will drop below freezing before solid ground will get to the freezing mark. And when there’s moisture falling as temperatures are taking a dive, these elevated surfaces will turn icy first. Since ice is denser than snow, it’s more difficult to gain traction when driving on an icy road than it is while traversing a snowy one. Why is it more difficult to drive on ice than it is to drive on snow? Both snow and ice are frozen precipitation, and both can make driving treacherous. But ice crystals are more tightly packed together than accumulating snowflakes are. This makes ice much denser, slicker and more difficult to deal with. When you walk or drive on snow, it often collapses inward under the weight of your body or vehicle. This can help you retain traction as you move through snow. With moderate accumulations, your foot or tires might even remained anchored to the ground as you move through snow. But a sheet of solid ice can produce far more resistance to anything sitting on top of it. So, even when an inch of ice is on the ground, it’s unlikely that your foot or tires can break through it to maintain contact with the ground (which provides decidedly more traction than an icy surface does). Even if you’re driving a Mack truck, you’re at the mercy of the icy surface, which can cause you to skid out of control quite easily. 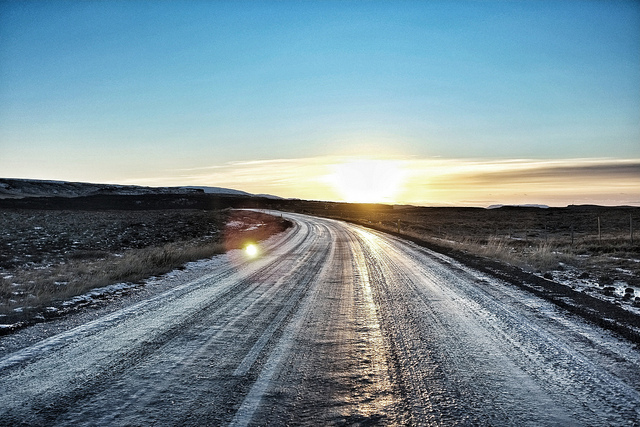 Driving on icy roads can be a dangerous, and potentially deadly, situation. If an ice storm hits my area, how long should I wait to drive? While it’s difficult dealing with any winter weather, any amount of accumulating ice can cause incredibly dangerous travel conditions. We’d recommend staying off the roads as long as they’re covered with ice. Driving on icy roads can easily cause you to lose control of your vehicle, and the results can be deadly. Although it takes particular — and relatively uncommon — atmospheric conditions to create an ice storm, these storms essentially paralyze the regions they hit. Whether you’re planning on moving, taking a road trip or heading to the grocery store, ice storms can make travel treacherous. That’s why it’s best to wait until temperatures rise above freezing and the accumulated ice on the roads thaws out. Garrett’s Moving and Storage has moved thousands of people across the Dallas-Fort Worth Metroplex and across the nation since 1992. We have extensive experience with both residential and commercial moves. If you, or anyone you know, are looking to move, consider working with Garrett’s Moving and Storage. Request your free moving consultation today! This entry was posted in Travel Tips and tagged ice storm, icy bridges, travel. Bookmark the permalink.